Well, as I mentioned in my own rant, I wish I had chosen to turn the game off. For me, the ending fell apart because I just didn't believe that the "Prince" would do it. The dialogue in the game didn't really support the idea of life-changing romance on either side. While I can understand seeing the physical interactions with Elika as a basis, I found these animations to be so annoying and disruptive of the game's platforming flow that I was unable to appreciate them as characterization. And outside of the platforming the physical interactions, especially the Prince's inconsistent reaction to Elika's post-healing exhaustion, didn't effectively convey this romantic story. I think part of the trouble here is that we have no way of seeing into the Prince's head. He's almost a total cipher to the player, even at the end of the game. What did you think of the plate powers? I thought some of these powers, especially the flying, fell into an unfortunate learn-by-dying routine. On the other hand, the "breath of Ormazd" was, I thought, an intriguing visual metaphor. Nice writeup. I'm quite anxious to get my hands on this game. I'd be interested in hearing your thoughts on roguelikes (Ancient Domains of Mystery, Izuna, Shiren the Wanderer). I am very much a gaming tourist myself, but I find the challenge of a well made roguelike irresistible. I think it's because most games have death as an annoyance, whereas in a roguelike it's something to actually fear. I don't get why "switching off your console" should be a valid alternative. If the game itself doesn't hold up consistently without you having to self-censor it... that's pretty bloody poor, in my view, and does not bode well for the 'games as art' argument. Imagine if the bottom half of Mona Lisa was a slack-jawed stick figure and to "appreciate it" you had to ignore or cover up that part of the picture. That strikes me as rather weak. I should probably mention, however, that I haven't played this game yet and have seen barely a few screens. I haven't played much of this PoP, but I'm enjoying it so far. It's not Sands of Time, despite the (right minded) attempt to recreate a lot of what made SoT so good. The removal of death is brilliant and end of the end of the day, simply a cosmetic choice. The way the game is played doesn't change much. Combat seems to be where the game falls down the most. Someone else said this, but the combat pacing is really quite slow. It seems antithetical to the Prince's acrobatic and elegant demeanour in the platform sections of the game. I definitely agree (and there's experimental evidence for this as well) that in-game dialog works better than dialog delivered as a granular action. The optional conversations with Elika are good, but I wish they were embedded seamless into the rest of the game, instead of requiring me to stop playing and listen. Since I know you're a fellow Idle Thumbs fan, I wonder what you think of their comments on the game. I think it was Chris who said that, while the removal of death was nice in some ways, it felt like it also removed any weight from your actions. They said it cheapened the moments when you performed well, and generally agreed that Sands of Time had a better do-over mechanic. As for the plate powers-- those segments are pretty but poorly-conceived. They vary the gameplay, which is nice, but you're right: it's straight learning-by-death. Were I writing a longer review I would feel duty-bound to mention that they're a misstep. 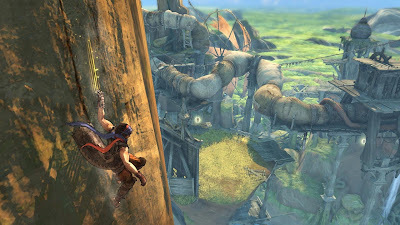 If the gameplay itself were done well it would be a welcome modulation of the basic platforming. @thesimplicity: I saw your write-up of shiren! I'm spending some time away from the consoles so I might try to pick it up, I've seen it pop up on quite a few best-of-handhold lists. @ben: It's hard to explain without going into spoilers, but the basic idea is: at the end of the game there is *one* last action you have to perform. You don't get a choice in the matter, and the action you have to do is bad. So your only choice is: finish the game or turn the console off. It's not like the game says: "finish now or turn it off", but that's the situation. Also, totally agree about the dialogue. I mean, in the series itself you have this excellent model of how to integrate narration and gameplay! why go back to watching the prince and elrika talk at each other? @matt: yeah, I see what the Idle thumbs guys were saying: how do you make the player's actions matter, if not by punishing them for acting wrongly? For me, taking away death gave you an incentive to push yourself into a real fluid and continuous rhythm. The feeling of flowing grace you get when you nail a new passage is the reward, and I think *that's* how the game makes your actions matter. A great review, thank you for reviewing the mechanic, and philosophy of the game, rather than the faults. Your side on removal of death was interesting- To paraphrase, "your companion deposits you on the last bit of stable ground". Isn't this just the same as dying and reverting to the last checkpoint, but with all stable ground serving as a checkpoint? As a counterpoint though, compare this rhythm game with another, say Guitar Hero. The appeal of GH lies in "falling into a rhythm", as you say about PoP, yet you still 'die' when you fail a song. I'm totally with you on this review, I riquois. I think the game is great, and I think your comparisons to rhythm games is particularly smart. I still need to write up my review of this game, and I'm sure I'll have to point back here becasue I want to talk about the rhthym of the game, too. @Iroquois: Yeah, the plates were a good idea in that the light seed collection encourages the player to explore the game world. And, like I said, the imagery of the Prince and Elika holding on to each other as they're blown about by the winds of fate really works with the breath plate. The design of some of those other sequences was lacking, though. I think the flying would probably have been fine without the navigational component. @pokwas: I would really like to write a post about what I liked in Prince of Persia, because much that it does is admirable. Except for the ending and the swordplay I loved the experience, and there's still a lot to discuss. I haven't even seen anyone really talk about Zur's score yet, which was almost perfect. The ending has really colored my view, though. I'll probably try again in the spring or summer. @pokwas: I don't want to give the impression that I'm blind to the game's faults-- as I said I don't think the non-platforming elements (the combat, the puzzles, the plate powers mr. clarkson mentions) are particularly compelling in their own right, and this is certainly a problem. But they were fine, and they did break up the platforming which was very strong. Also, what I tried to do was counter the major objection the game-- that the removal of death made the game too easy. I think the comparision to guitar hero is pretty apt, actually. Or maybe Rock Band 2 in no-fail mode. The thing is, you still try to play as well as you can and you're still *creating* something aesthetically worthwhile through your actions. @g. christopher williams: glad you liked it. I have this sort of idee fixe, which is that the game is like guitar hero and the terrain is your note chart. They establish this rhythmic feel in the combat too, but to lesser effect, because it's not cued to the environment in the same way. It would be better if combat was more about "reading" your enemy's patterns and cues. As it is it's all about stringing together these combos in tempo, which is nice enough but not outstanding. Much like Sparky, I felt that the ending was wrong. I don't feel like cutting off the game is a valid game narrative choice. If they had added an alternate, in-game choice, I'd have been much happier with the ending. I don't think the movement between the characters invoked the idea of romance. I think it's because some of the Elika movements broke the flow of the game. Also, perhaps, that the touching doesn't == romance for me. There have been plenty of protagonists who touch (Jax and Daxter, Banjo and Kazooie, and so on) who were friends or even enemies. That, and I pretty much assumed Elika was doomed from the beginning, and never believed in their relationship as a valid possibility. It was an interesting idea, but without strongly establishing them as in love, the ending doesn't just fall flat, it fails badly. I also wanted to take issue with the idea of the ending as a "moral choice". I don't think turning off the game is a narrative choice. So, for me, the end offered no choices, or a choice between an incomplete, comprehensible narrative and a complete, incomprehensible one. It's not that it isn't moral, for me, but that it isn't a real choice. Great review!! I too got one copy from EBGames... It is very interesting video game to play!! the perfect music to play Prince of Persia. great review, but I have one thing to add: music. i guess what i mean to say is, that if you want to play this game and really enjoy it, there is something YOU should add: music. the game music is really dull, at times cheesy, and during boss levels just cliche. ripping some good ambient music to your xbox and making a playlist before putting the disc in is a must, and i think that this makes the game, like, 100x better at least. for wallrunning/exploring: sigur ros (group, also on the TV commercial), air (group), massive attack (group), the song surfin by william orbit is great, and that Teddybears mix of still alive can be used (from the mirrors edge soundtrack). for bosses/fighting: paul oakenfold or crystal method. And it's true that some of the Elrika-Prince animations broke the rhythm of the platforming. Maybe you're right, it's annoying to wait for Elrika to jump on your back. However (and maybe this is totally subjective), I found the interactions between the Prince and Elrika really charming. Again, I didn't mean to imply that the game proffered an explicit choice between finishing and shutting the console off. But doesn't the fact that the ending h evoked such strong emotions, both positive and negative, mean that it did something right? Listen, I get you frustration, but I think the ending *intends* to feed on the feelings of meaninglessness and fatality that it creates. @Philip: Thanks for the praise! However, I find it difficult to overlook the fact that you are some kind of robot. @too tall abe: One of my personal frustrations with PoP is that the music doesn't really stand out. Given that their aims in this installment are primarily aesthetic, I was surprised by how unmemorable the music was. custom playlists, like your own, are the order of the day. Your description of the platforming gameplay reminds me of Jet Set Radio (aka Jet Grind Radio) and its sequel, Jet Set Radio Future. I think it comes down to having well-thought-out level design combined with a game situation where you're usually moving at one of two fixed rates, thus keeping the jumps reasonably predictable.